Last week, Michelle and Sue had the pleasure of attending the City Link Festival in Hamburg. “City Link started in 2012 as a co-creation project between cultural communities in Copenhagen and Hamburg with support from the City of Copenhagen and the City of Hamburg.” The 4 day festival began with a bus ride along with 78 participants to Hamburg from Copenhagen. Upon arrival, the group visited a few art galleries displaying the works of artists from all over Copenhagen and Hamburg. The evening was spent at Gängeviertel with live music and introductions by a politician and book author. 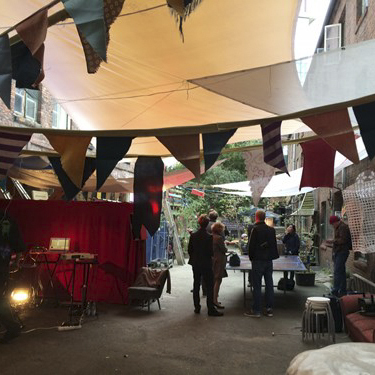 Gängeviertel is a great example of the success of the squatter movement in Hamburg bringing a very diverse set of users to the space. To learn more, check out their website http://das-gaengeviertel.info/. The following day was spent at the new Hafencity University where a congress took place over the course of the day. Various professionals in the realm of the built enivronment spoke about their areas of focus and issues we see today in urban design. Many professionals from Copenhagen joined the discussion including PB43’s Steen Andersen. Above is a photo taken during the congress looking towards the heart of the shipping industry in Hamburg. The last two days were spent on workshops and exploring the city. Sue and Michelle had the opportunity to visit various parks and urban projects in Hamburg to further learn about the current design movements in the city. Overall, it was a very fruitful festival with very relevant topics in our profession being discussed. If you would like more information about the festival or to get involved, visit http://city-link.org/.